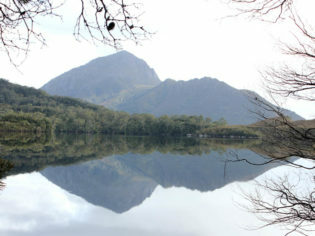 The hauntingly beautiful Mt Rugby in south Tasmania. Tasmania’s South Coast Track is savagely beautiful slice of the planet with the power to break hearts as well as make some stay forever. Take a multi-day walk with us through the remarkable Southwest National Park. “We’re expecting severe turbulence during our flight today,” comes the pilot’s matter-of-fact announcement through the headset. We’re already strapped into the eight-seater plane, which feels considerably smaller than a soccer mum’s SUV, and the window for retreat is well and truly closed. Our destination in Tasmania’s south-west wilderness can only be reached by this amusingly miniscule machine or a seven-day hike. As we trundle down the runway with a belligerent wind nudging us sideways, the second mode of arrival seems entirely more reasonable. By some scientific or divine marvel we’re soon airborne and as the wheels tuck underneath us, the threat of bad weather loses its potency. The higher we climb, the more Tassie’s southern coastline unfurls beneath. We watch a miniature ferry deposit toy cars on Bruny Island, spot the salmon farms that float on the dark waters like raindrop rings, and pass the incredible and foreboding dolomite columns that rise from the sea like exclamations of doom. The plane seesaws nauseatingly and hands reach for sick bags. Just when my breakfast is preparing for a reappearance, the airstrip at Melaleuca beams into focus. We pass so close to a mountainside that I feel sure our wingtip will slice blades off the tops of bristly grasses. Then, we’re abruptly at a halt. We tumble out, blinking at the brilliant white of the quartz tarmac and up at the surrounding mountains that shoulder us like austere bodyguards. Landing at remote Balmoral Beach with Mt Rugby in the background (photo: Matt Glastonbury). For the next three days we’ll be in the capable hands of Greg Wells of Par Avion Wilderness Tours, and are heading to the company’s camp in the World Heritage Southwest National Park. It’s the first tour of the season and Greg assures us we’ve picked the worst month to come. October, it turns out, is characterised by changeable, unpredictable weather and choppy winds. By Tasmanian standards, that means you can expect the weather to swing from freezing with bone-chilling winds and rain to freezing with glimpses of sun every three minutes or so. “I love it when it’s wild,” Greg enthuses. Once I’ve realised there’s little point in removing my windcheater each time the sun makes a timid and fleeting entrance, I soon come around to his point. Gliding through the waterways of the Port Davey Marine Reserve, I notice the wake of our vessel is the colour of Coca-Cola, fizzing and bubbling as we speed along. The view from Mt Beattie looking out into Port Davey. Later, when we stop at the Celery Top Islands, it looks like freshly brewed English breakfast tea lapping the shore, inviting you to fill your cup. Dyed from the tannin of the abundant melaleuca, the freshwater sits above the saltwater like a heavy black cloak and stirs imaginations of what lies beneath. Hades of the Underworld tending his guests after their journey across the Styx, perhaps? In the stillness of the morning, it’s as black as obsidian and mirrors the landscape so acutely you lose all sense of which is real and which is the facsimile. Flinders clearly didn’t have an appreciation for natural gems. Though wild in a hectic, tumultuous sort of way, the south-west wilderness is breathtaking. Bern’s Keyhole, a natural arch on the Breaksea Islands (photo: Matt Glastonbury). Ambivalent to the petty attempts of humans to settle her and unapologetically harsh, the Bathurst Harbour and Port Davey area with her mountainous sentinels, including Mt Rugby and Mt Milner, is hauntingly beautiful. Ironically, the south-west’s perceived ugliness and resistance to settlement is what has preserved her to be admired and cherished today. Useless for grazing with a treacherous harbour and obstinate weather meant this sizeable wedge of Tasmania was left largely unmolested over the decades. Of the 10 criteria needed to qualify as a World Heritage Site, the south-west has seven. It seems incredible that in an age where serious investigations are being made into the viability of colonising Mars, a place on Earth could remain so pristine and unsullied by the sprawl of humanity. Unfortunately resources for continual preservation are tight and despite its status as a national park, Greg has witnessed poaching of the protected Huon pine, an incredibly slow-growing tree prized for its light, water-resistant wood. He tells us that, apart from volunteers over the summer months, the entire 4500-square-kilometre area is patrolled by one, rather lonely ranger, leaving the pines and other natural treasures open to exploitation. Despite its poor conditions for sustaining human life, attempts have been made successfully and spectacularly unsuccessfully. It’s claimed the indigenous Needwonnee people competently lived their nomadic lifestyle here for 30-40,000 years, reportedly slathering themselves with seal fat to insulate against the cold. The swirling waters of Southport Lagoon. Far less competent was an attempt made by Melbourne-born Critchley Parker who set out in 1942 to find a suitable location to establish a Jewish settlement for those fleeing Nazi Germany. Oddly, two of the most remote places in Australia, let alone the world, were preferred for the new Jewish homeland: the Kimberley in Western Australia, and Tassie’s south-west. With Hitler’s genocidal intent clawing through Europe, escaping to what seemed like the edge of the Earth would have felt like true salvation. So Parker set out with his provisions, which included a box of matches meant to be his lifeline. Although he was an experienced walker, he made a plan with the sole resident in the vicinity, Charlie King, to create two columns of smoke should he need help. But the weather closed in, Parker’s smoke was swallowed by mist, his matches became damp and so did his lungs. Weeks later he was found dead in his sleeping bag by local fishermen. Poetically, Parker was the only one to ever permanently take up residence in his imagined settlement, his bones decomposing with his dreams in a grave under Mt McKenzie. From a little beach at the camp, a look across the water reveals one of the few shreds of evidence of a life actually lived in this raw environment: a jetty protruding from the dense vegetation like an arm outstretched to friends. A view of Tasmania’s Toogelow Beach from Mt Milner. It’s the site of Clyde and Win Clayton’s former home and now a spot of respite from the weather for fishermen and adventurers to these parts. Win Clayton was sister to Denny King, a local legend, tin miner and the man who built the airstrip we descended on. Both the Claytons and the Kings are lauded for their frontier-style lives out here. Over the days, Greg regales us with stories of the family who carved out an idyllic life in this wild, isolated land. They were tough, resourceful, and welcoming to all who toiled or travelled near their home in the wilderness. They saw neither the horror that Flinders beheld, nor the industrious settlement Parker imagined, simply a wild, capricious wonder of nature taken to sudden bouts of mischief and beauty. We putt out of Old River into more open waters just as the sun makes an entrance. Above us form two unfathomably complete rainbows arching from one landfall to another, bathing melaleucas and celery top pines in a wash of colour. Beneath the arc sits a moody Mt Norold, bruised with rain and mist haunting its peak like wraiths. There could hardly be a more concise example of the duality of the south-west wilderness: a place where one man’s hell is another’s paradise. Getting there: You can either take seven days to walk the South Coast Track to Melaleuca and book a return flight with Par Avion or you can fly in and walk out. If you choose to walk, be prepared to carry all your food and equipment. Alternatively, fly in and out for the South West Wilderness Camp.